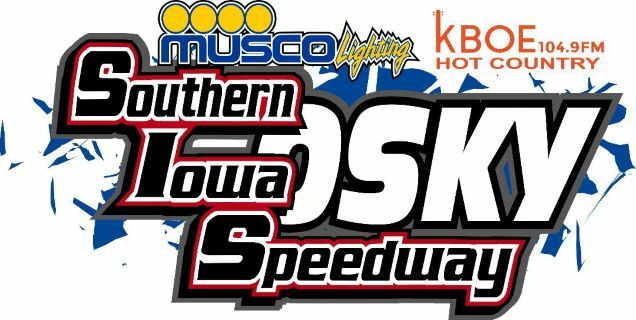 Oskaloosa, Iowa: The 2019 racing season at the Musco Lighting Southern Iowa Speedway got underway on Wednesday night despite the cold windy conditions. The Southern Iowa Fairboard provided the racers with an extremely smooth and wide racing surface and the racers responded with a nearly caution free program that saw the final checkered flag of the night wave at 9pm. The Kraig Ford/Pella Motors season opener saw competition in 4 racing divisions. The first main event of the evening was the Oskaloosa Quality Rental Sportmod 16 lap feature. Austin Paul drove his A5 machine into turn one in the lead and went on to lead all 16 laps despite the constant challenges from defending Track Champion, Curtis VanDerwal. After starting in the third row, VanDerwal was able to close to the rear bumper of Paul but Paul was not rattled and drove a perfect race in capturing the season opener. Logan Anderson ran a strong race in crossing the finish line in third. Next up were the Midstate Machine Stock cars, The “Gas Man” Cayden Carter took advantage of his front row start and went on to lead the main event flag to flag. Carter was challenged early by Derrick Agee but was able to move out to comfortable lead as the feature laps wound down. Agee crossed under the flag stand in second ahead of Michael Petersen. Defending track champion Nathan Wood fell out of the race due to a lost oil plug which led to and engine fire. Fortunately Wood was able to get his engine off quickly to avoid interior engine damage. The Autocrafters Sport Compacts were next to take to the Mahaska Monster ½ mile. Brandon Housely debuted a new car with a new number on Wednesday night. Housely, who is the defending track champion drove his new mount to the win in the 10 lap main event. Housely took the checkers first in his #213 ahead of Trent Orwig and Billy Cain. Defending track champion, Dustin Griffiths started off the new season in fine fashion by scoring the Parker Tree Service 14 lap feature win. Griffiths advanced from the third row to take the win over Derek Kirkland and Clint Nelson. Wednesday April 17th will be “Kids Night” at the races presented by Great Southern Bank. All Kids will have an opportunity to ride in their favorite drivers race car prior to the races. The Musco Lighting Southern Iowa Speedway will see action start with hot laps at 7 pm with racing to follow.